This collection is one of the most important discoveries in Chinese numismatics over the past decade. 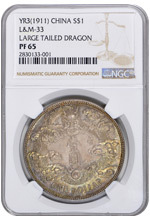 The Cherrywood Collection includes examples of a Year 3 (1911) Long-Whiskered Dragon Silver Dollar Pattern, L&M 29, graded NGC Specimen-64, and a Year 3 (1911) Large-Tailed Dragon Silver Dollar Pattern, L&M 33, graded NGC Proof-65. All coins are being offered unreserved in our April 2019 auctions and will be on display at the Hong Kong Coin Show - Table B21 - March 29-31, 2019. Download the promotional brochure on the Cherrywood Collection.